Location: Devil’s Hole Cave is located in Devil’s Hole State Park, just north of the City of Niagara Falls, NY. The park has two parking areas. One can only be accessed from the southbound lane of the Robert Moses State Parkway. The other parking area can be accessed from the northbound lane of the Robert Moses State Parkway and Route 104. Devil's Hole State Park overlooks the Lower Niagara River. A hiking trail leads from the park down 300 vertical feet to the turbulent Devil's Hole Rapids. The very rugged trail affords spectacular views of the gorge and the rapids. It is a popular spot for fishermen especially for salmon and trout. Park regulations state that you must stay on established trails and do not enter the water. A few picnic tables can be found in the area to the west of the restrooms. Admission to the park is free. The following description was taken in part from a brochure for the Great Gorge Route Railroad and the Niagara Falls & Suspension Bridge Railroad. The brochure is undated, but local historians tell me it was most likely printed in the late 1890's. Comments by the author are in [italics]. 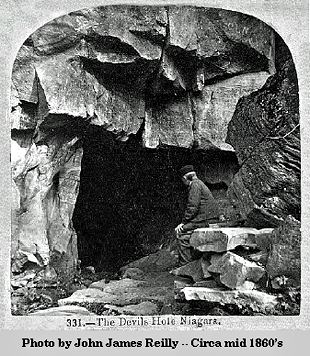 Teeming with Indian legends, replete with wild picturesque scenery, the great Council Rock of the Indians, the Lost Channel of the Bloody Run, the Mineral Spring, and the awful precipice over which 350 British Soldiers were driven, makes the Devil’s Hole the most interesting point at Niagara, and is deserving of a more particular examination than has heretofore been within the power of the visitor to make. Where the old Bloody Run stream used to wind in its circuitous dash to the river, falling over 300 feet in its short journey of less than 1,000 feet. There is not a drop of water running through the channel now, while less than fifty years ago there was water enough to run the old saw mill. September 14th, 1763, Three hundred and fifty British Soldiers, which composed a supply train, marched on their way from Fort Niagara to Fort Schlosser [located about two miles upriver of Niagara Falls], marched alas only to meet their death. On the large flat rock back of the Devil’s Hole buildings [restrooms], beside the little stream, these soldiers halted for dinner. While they were eating they were attacked by the Seneca Indians. The first fire produced great destruction of life. Those who were not thus killed were driven over alive over the awful precipice. After these men jumped the Indians drove the Horses, Wagons and baggage of the entire train over on top of them and only two survived to tell of the plan conceived and carried out by the Indians to massacre them at this particular spot, where a careless guard would be at the mercy of a hidden foe; a plan bold and skillful in formation, masterly in execution, was gained, as so many Indian attacks, by secret and deadly ambuscade. Is in the Devil’s Hole. The refreshing water bursts from the solid rock. Clear as crystal. The temperature of the water is 41 degrees, never changing. 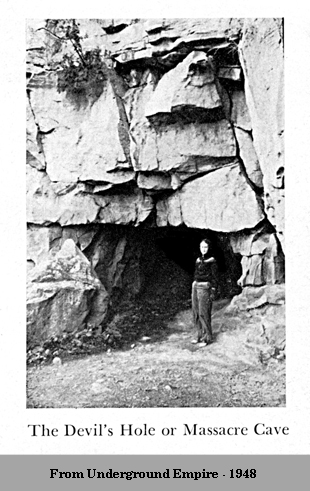 The entrance to Devil’s Hole Cave is 10 feet wide and 8 feet high. The floor of the easterly trending passage slants gently upwards, and after 12 feet the passage is only 4 feet high. Just past this point, the ceiling quickly reaches a height of 9 feet. The passage then gradually tapers in width and at 30 feet from the entrance there is a low man made wall that extends across the passage. Past the wall there is a 2.5 foot drop in the floor level. Past this point the passage tapers to 6 inches wide and 6 feet high in the remaining 10 feet of the cave. The passage can be seen to continue to the east. 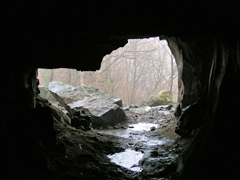 Devil’s Hole Cave is developed in DeCew Dolostone, a very fine crystalline dolostone that is dark gray in color. The rock dates from the Silurian Period and is around 420,000,000 years old. It is a solutional cave being formed by naturally acidic groundwater that seeps through bedding-planes, cracks and joints in the rock. Over thousands of years the rock is dissolved and the cracks enlarge. The dissolved rock is carried away by the flowing water. Stream scallops found along the northern wall, near the back of the cave and the Mineral Spring mentioned in the Great Gorge Route Railroad brochure confirm that Devil's Hole Cave is a solutional cave. 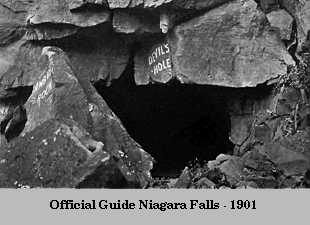 Devil's Hole Cave probably began to develop around 10,400 years ago, after Niagara Falls had eroded past the area that is now the Lost Channel. 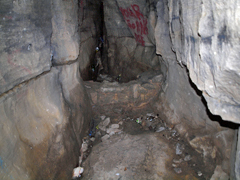 The Lost Channel is a re-entrant gorge eroded by an outlet from ancient Lake Tonawanda. 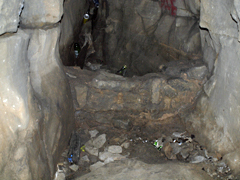 Early in 2003 I visited the cave and was appalled by the litter in the cave and decided to clean it up. The trash in the cave included a partially burnt wooden chair, dead cat, cat toys, numerous lighters, batteries, beer and pop cans, drug paraphernalia and lots of broken glass. I removed about 20 cubic feet of trash and debris. In the very back of the cave a low man made wall extends across the passage. A railroad spike and file were found on the eastern side of the wall. 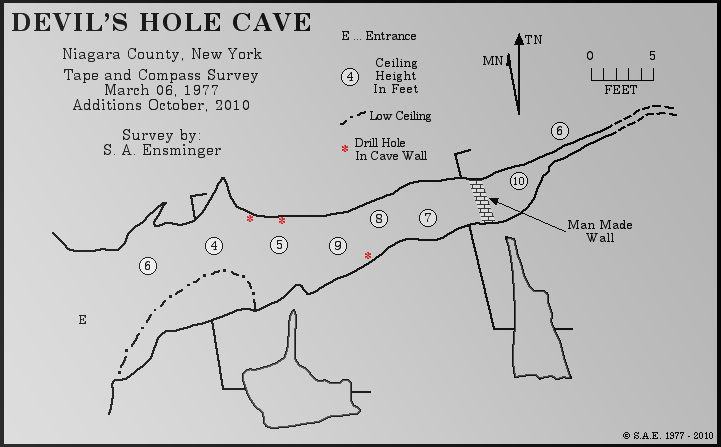 An examination of the cave walls located at least six drill holes in the walls and ceiling of the cave. When and why the the holes were drilled is still undetermined. The cave was very dry and dusty during my cleanup trips. A check of the cave in the Spring of 2004 found it to be very wet. Water dripped from the ceiling and flowed down the northern cave wall. A small pool 2 feet long, 6 inches wide and 6 inches deep was found eastern side of the wall. Smaller puddles were found closer to the entrance and a thin film of water flowed from the entrance. 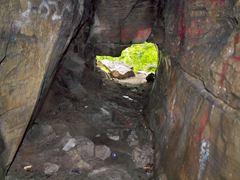 Today (2010) Devil’s Hole Cave is still a popular party spot for local youth. 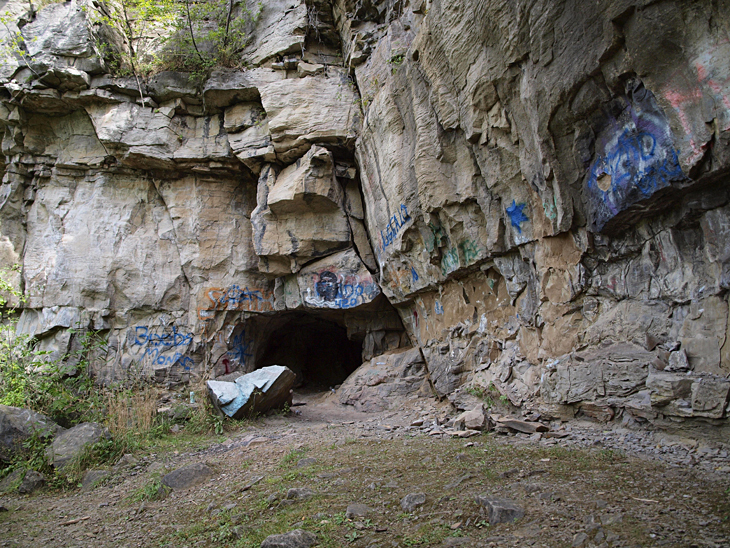 Sadly the cave and entrance area are covered heavily in spray paint graffiti. Trash and broken glass again litter the cave floor. The lack of respect for this interesting natural feature, which is considered a very sacred place by the Seneca Nation of Indians, is a sad commentary on those responsible for its deliberate damage. In the first three photos below you are looking out of the cave. The first photo was taken in Spring of 2004. 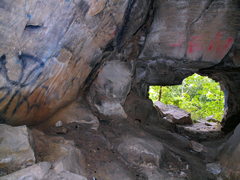 Note the puddles on the cave floor, The other two photos were taken in 2010 and show some of the graffiti on the cave walls. The first two photos in the second row show the man made wall that extends across the passage. 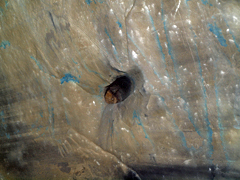 The last photo shows a drill hole in the southern wall of the cave. The drill hole is a little over 1 inch in diameter and 3 inches deep.